The average annual costs for tuition plus room and board have reached an average $45,000 for private colleges and $35,000 for out-of-state-students at public colleges. When students and parents learn about these staggering figures, panic and resignation can set in. 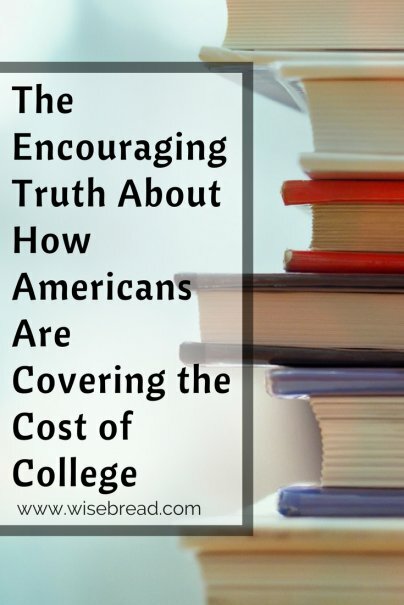 But it's important to keep in mind that most people don't pay the full sticker price for college — and what they do pay tends to come from a variety of sources, not just from savings or loans. Sallie Mae's 2017 How America Pays for College survey casts light on how families afford higher education costs, and may offer some reassurance that one way or another, you, too, can afford college. Despite those high average costs, Sallie Mae found that the average family paid only $23,757 for college in the 2016–2017 academic year. According to Sallie Mae's survey, a full 50 percent of college students now live at home with their parents, saving a ton of money on rent and cafeteria food. Even if they contribute to household expenses, the cost is likely to be less than it would be if they lived on their own. Funds that students don't have to pay back, such as federal grants, grants provided by the schools, and scholarships, cover more than a third of the cost of college for the average student. That's the largest funding source, greater than what either parents or students contribute, and it's been on the rise in recent years. In 2016–17, scholarships and grants covered 35 percent of the average student's costs, while back in 2012–13, they covered just 30 percent. That 35 percent translates to $8,390 that the average student receives toward college expenses and does not have to pay back. At more expensive schools, especially those with large endowments, the grants from the institution may be much larger. Four percent of the average student's college costs are covered by relatives and friends. That may not seem like much, but it works out to $900 for the average student, which isn't nothing. Parents, don't feel like you've failed if you don't cover 100 percent of your kids' college expenses. Students, don't feel like a leech if you can't handle 100 percent of your college costs on your own. The fact is, in the average family, students and parents each contribute about the same amount to college expenses; 30 percent comes from the student and 31 percent comes from the parent. On each side, that contribution is a combination of savings, earnings, and loans. For better or for worse, use of this tax-advantaged savings vehicle is waning, with only 13 percent of parents of freshmen paying college costs out of a 529 account. Use of these accounts appears to have peaked at 17 percent in the 2012–13 school year. Budget-savvy students know that the cost of college doesn't have to be so high if you work at saving money. Half of students are living with their parents; others are renting textbooks or buying them secondhand, living off campus, and bicycling to class. While past studies indicated that more expensive schools offered a greater return on investment, a more recent study, A Regression Analysis of College Tuition and Mean Income, concluded that's no longer true. Nowadays, once differences in family earnings, race, and test scores are eliminated, there is little difference in earnings between graduates of expensive schools and graduates of more affordable schools. The study suggested that the only variable in colleges that might lead to increased earnings is the expenditure per student, which isn't always highest at the most expensive schools.